No, I don’t work with red wands out on the apron; no, I don’t get cold working outside in winter; and, no, the airplane noise does not hurt my ears. But, yes, these are all questions I have heard when I tell people about what I do as an air traffic controller. I want to highlight some of the careers in air traffic services and showcase two women who help make the skies safe. Ashley Dale is an area controller at the Air Operations Centre in Edmonton. NAV CANADA is the company that owns and operates Canada’s civil air navigation service (ANS) which provides air traffic services across the country. This is no small feat as the organization manages more than 18 million square kilometres of Canadian and oceanic airspace and approximately 3.3 million flights a year. What is not as widely known is, that currently in Canada, only 17 per cent of air traffic controllers are women. Compared to female pilots and aircraft mechanics, this number is actually well above average, but 17 per cent is still a low number. Especially when a career in air traffic services is such a rewarding, fulfilling one. There are three types of air traffic service careers in Canada. The first is as a flight service specialist, who provides the pilot valuable advisory, flight and weather information, often in remote locations. The second is as a tower controller, who works in the control tower at an airport and who controls aircraft at, and in the vicinity of, the airport. Finally, the third is as an area controller, who is someone that works inside one of seven centres across Canada. These centres are where all the aircraft are controlled across Canada and over part of the ocean. Kristina Murphy is a tower controller in St. Johns’, Newfoundland and Labrador. “There’s a certain thrill in being an air traffic controller, one that you can’t describe until you take the mic, clear an airplane for take-off and watch it climb into the sky,” says Murphy. “No two days are alike and there’s something to be said about having a career where every day brings a new challenge.” Murphy helps advocate her career to women through Elevate Aviation based in Edmonton, Alberta. Ashley Dale is an area controller at the Air Operations Centre in Edmonton. “I love being an air traffic controller because it’s dynamic and fast paced,” she says. “I’m constantly learning new skills and improving on old ones.” Dale controls aircraft flying through an area of airspace known as the Edmonton Enroute specialty. Both women never knew about the variety of careers in air traffic services until they were introduced by friends. This elusive career has been a well-kept secret and, in my humble opinion, it’s time to shout out loud and clear that this is one career everyone should stop and take a look at. NAV CANADA will be holding its second annual Explore Aviation Summer Camp, being held in 2019, which accepts applications from students going into grade 10. This year was the first summer camp where 30 young women from across Canada spent a week in Cornwall, Ont., and travelled to Montreal and Ottawa on day trips. The young women had the chance to practice in air traffic control simulators, visit the Ottawa air traffic control tower, the Montreal air traffic control centre, make an Automatic Dependant Surveillance Broadcast (ADS-B) box to track airplanes live, and much more. Next year, the camp will be extended to two weeks and all genders can apply. For young people looking at aviation as a possible career, they can also contact Elevate Aviation to learn more about specific roles in aviation, arrange a visit to get in and see these roles in action, and even to speak to a personal mentor. Elevate will have cross country tours visiting 20 locations across Canada in March 2019. Attendees will be able to take part in a free day of presentations from aviation professionals, touring different aviation facilities, which will include an air traffic control centre or an air traffic control tower. If you are looking for a career that stimulates you, challenges you, offers a wonderful lifestyle, and is a career you can be deeply proud of, I encourage you to take a look at air traffic control and join us in serving a world in motion. 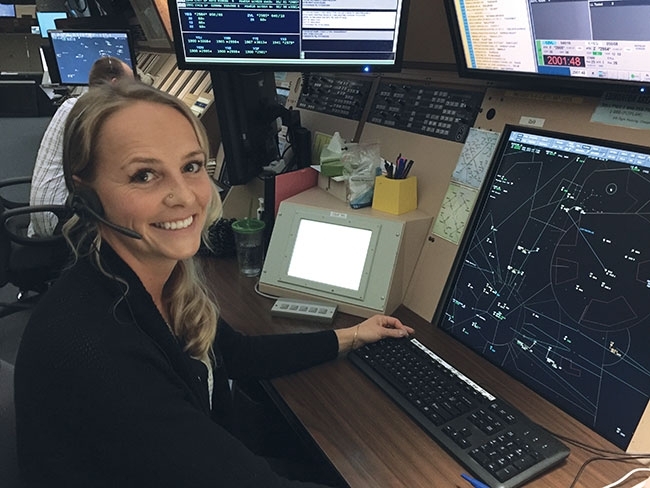 Kendra Kincade is an air traffic controller with NAV Canada and the founder of Elevate Aviation.